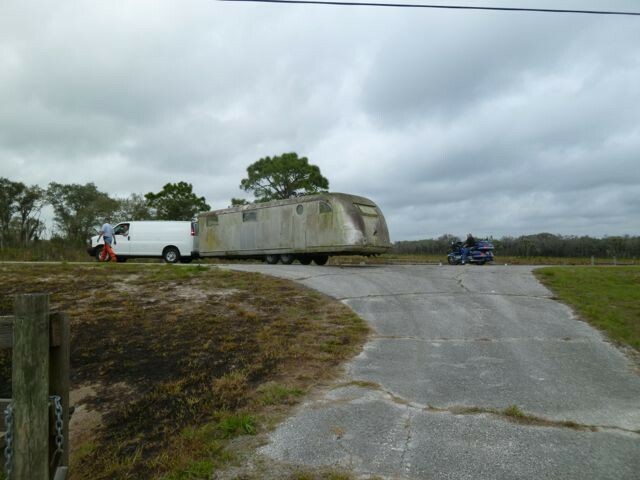 The Spartan Mansion trailer located at Tucker's Camp was removed from the Carlton Wednesday morning, Feb. 26, 2014. 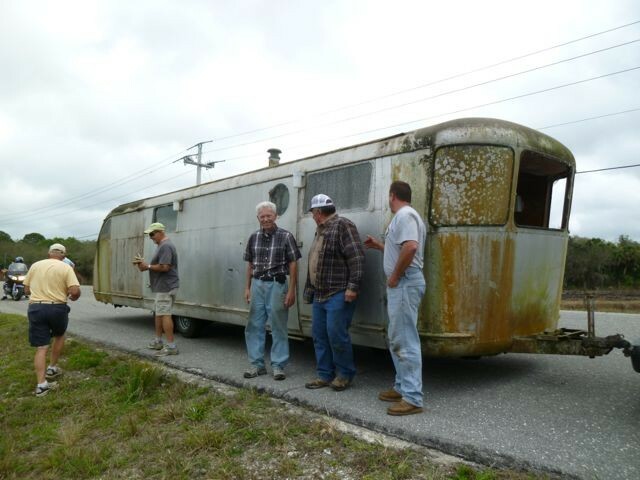 Bill Lemons from La Porte IN prepared the trailer for transport and then pulled it out of the Carlton to be renovated at his facility. 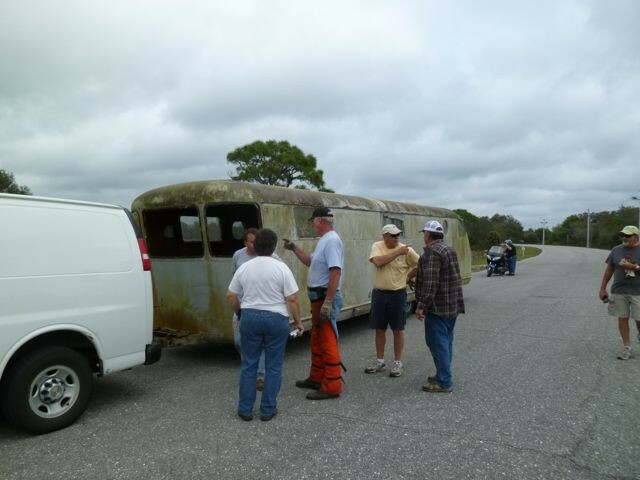 This saved the County the expense of removing it while providing Bill Lemons with a "project" for his hobby. 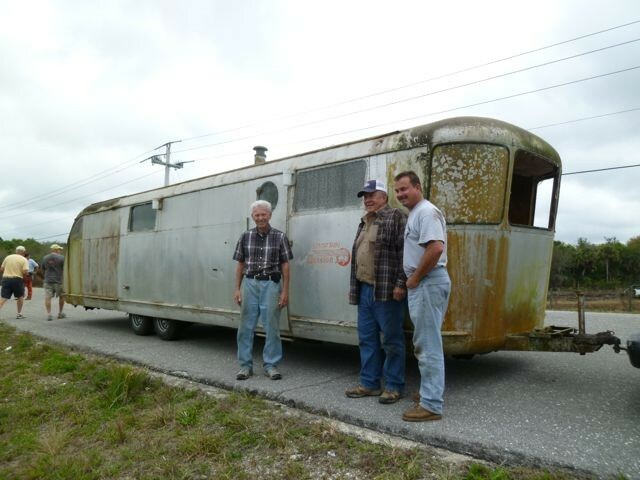 Thanks goes to Kenya Leonard who recognized that the 1949 Spartan trailer could be a "collectible". 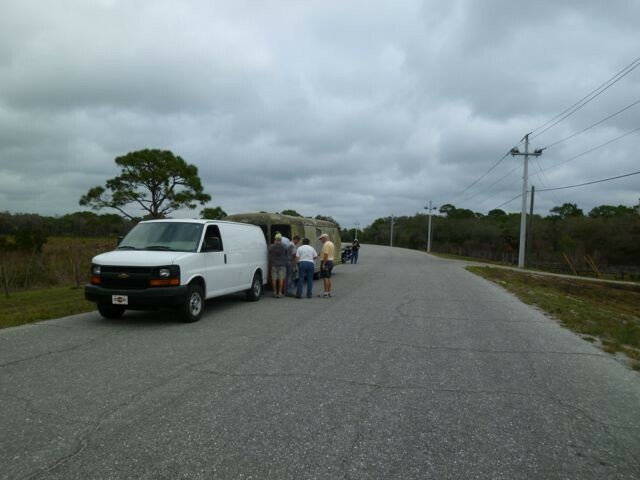 Thanks also goes to Debbie Blanco who coordinated the project and let the Friends group find a future owner. 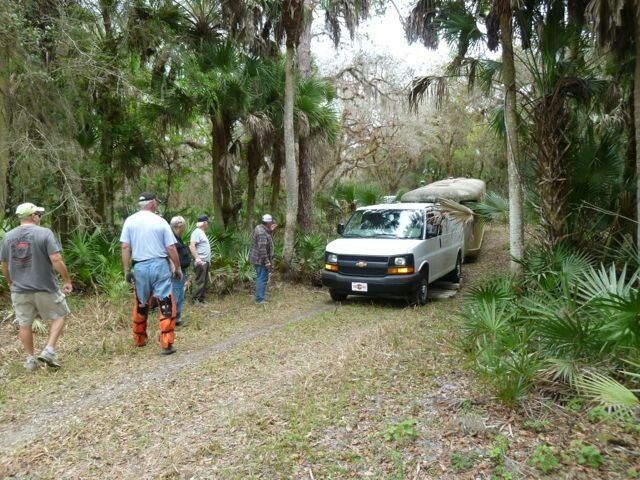 It was the Wednesday morning Sarasota County volunteer crew who did the actual work of preparing the route for the trailer out of the Carlton via the South Border Trail. The removal effort was on schedule and according to plan. Amazing! 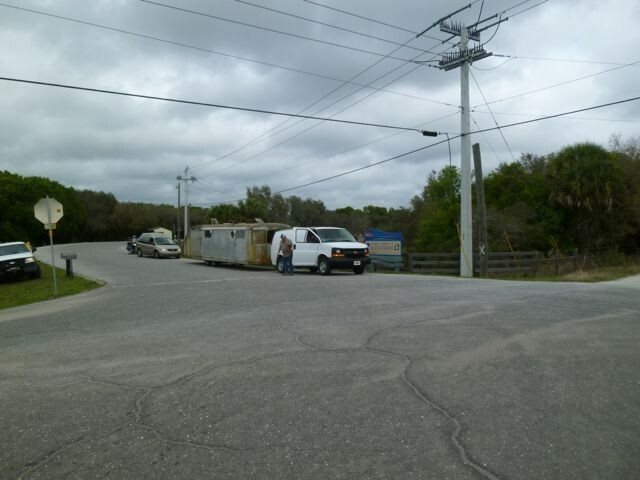 When the Carlton came into public ownership in 1984, the County used a second trailer on this site as a field office. 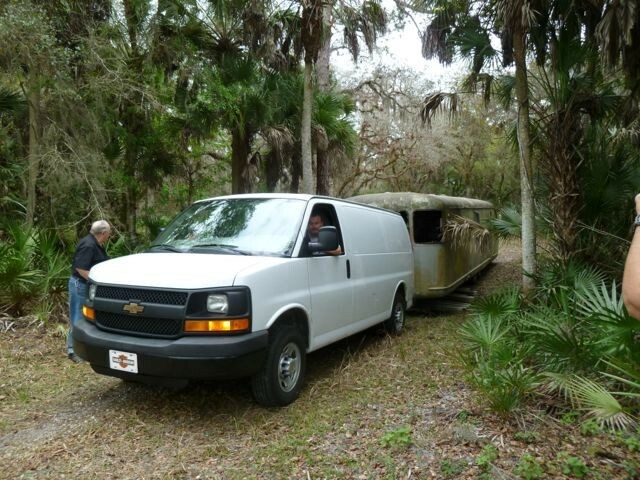 That trailer burned up in a 6000 acre fire in May, 2000, which also ravaged the oak canopy in an area that is the designated site for public use facilities ( the P.U.F. area that appears on County planning maps for the Reserve). 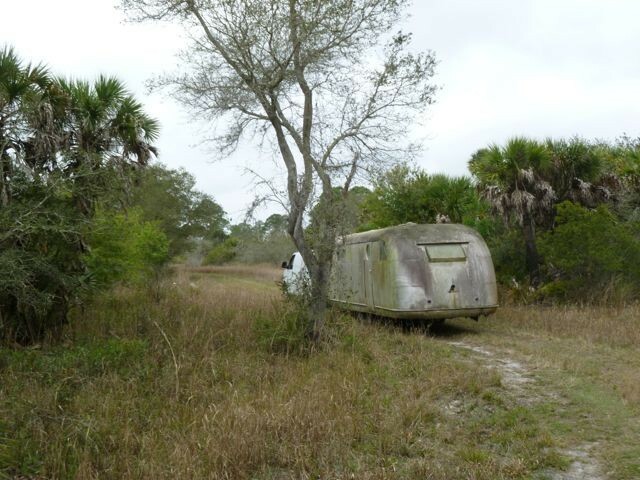 The trailer we removed today survived that fire but has been derelict for several decades and presented problems because of its dilapidated state in an area open to passive public recreation. 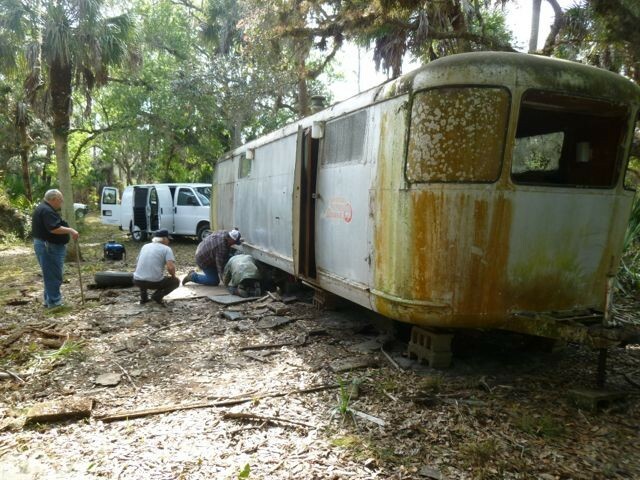 The County has long wanted to dispose of it but its remote location and condition made removal difficult and expensive. 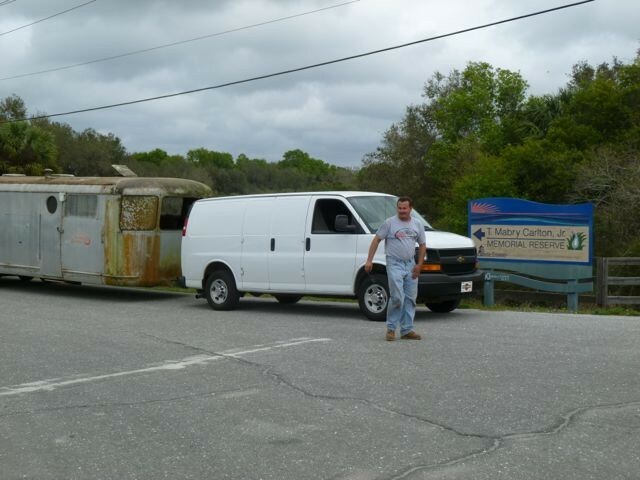 Russ Johnson, secretary and treasurer of the Friends of the Carlton, with permission from the County, advertised the trailer, hoping to find a buyer or other interested party willing to remove it with the help of volunteers, who would then clean up the site where unsightly debris and cabana materials had been left to decay. 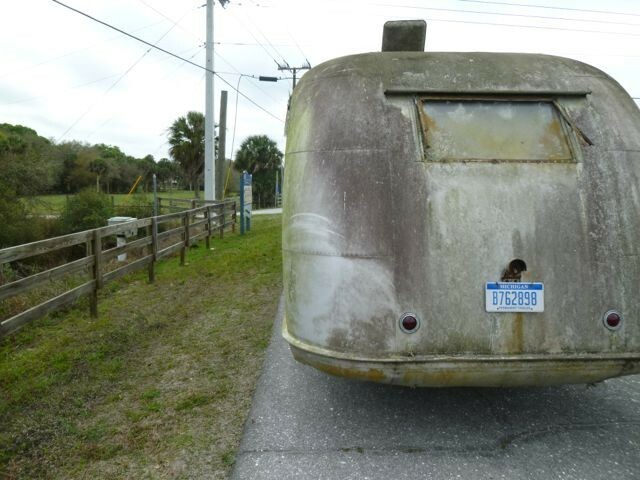 Constructed of heavy gauge, aircraft grade, riveted aluminum, this 1949 Spartan Mansion trailer is sought by collectors but the cost and difficulty of removal discouraged all but one. After 30+ responses, the list of interested persons who would undertake the task of removal at their own expense came down to Bill Lemons from LaPorte,IN. 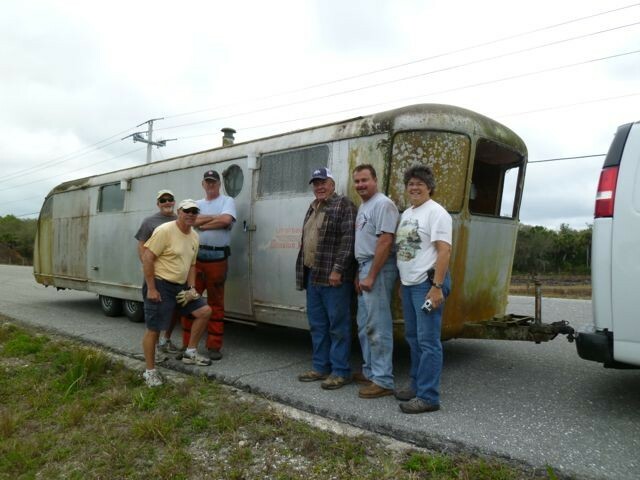 With his own crew and help from Sarasota County volunteers, most of whom are members of the Friends of the Carlton, Bill Lemons permanently removed the trailer after tearing off the cabana, and installing new hubs, bearings, wheels, and tires. Volunteers helped clear debris from the site and build a temporary bridge over a dry bed stream in which the 33' trailer would have "bottomed out." Some years ago, one of our "Friends" donated several truck loads of 4X4 "retired" real estate posts for making trail markers. 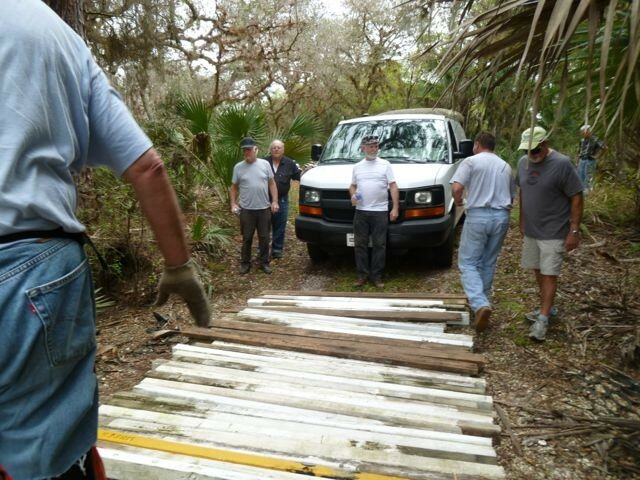 Our volunteers cut the posts to appropriate lengths this and created a temporary bridge in a low spot ahead of Bill Lemons' tow vehicle as the trailer made its last passage over 1.6 miles of rough trail to the nearest paved road. 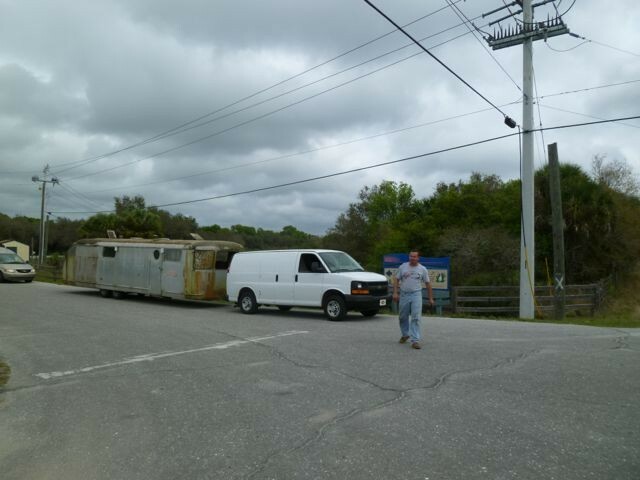 He plans to renovate/recondition the trailer. He shared pictures of previous such hobby projects he has completed to become part of his collection. We will post "before and after" photos as soon as they arrive. As we watched this piece of Carlton memorabilia being rescued, members of the work party speculated what the reaction might be if we pulled the trailer into an RV dealership and offered to trade it. And some of us remembered Lucy and Desi on their ill-fated turn into the wilderness on a rainy night in "The Long, Long Trailer." Volunteers man the cabin as often as possible. Russ Johnson and Bruce Hamill are often "on duty" to answer questions about the Carlton Reserve and offer a bottle of water or a cup of coffee. The Carlton was once the site of cattle operations and turpentining. 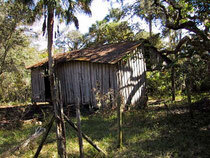 Six miles northeast of the historic cabin (donated and reassembled in the Carlton from its location on Phillippi Creek), now serving as the visitors center, is Windy Sawgrass Camp with this original storage shed, restored bunkhouse, cookshack, stables, dipping vat, and a working windmill. Florida Statute 704.6 referenced in deed restriction placed by SC Circuit Court, 1984. Provides for retention of "land or water areas predominantly in their natural, scenic, open, agricultural, or wooded condition; retaining such areas as suitable habitat for fish, plants, or wildlife, " which may be enforced by third party injunction. 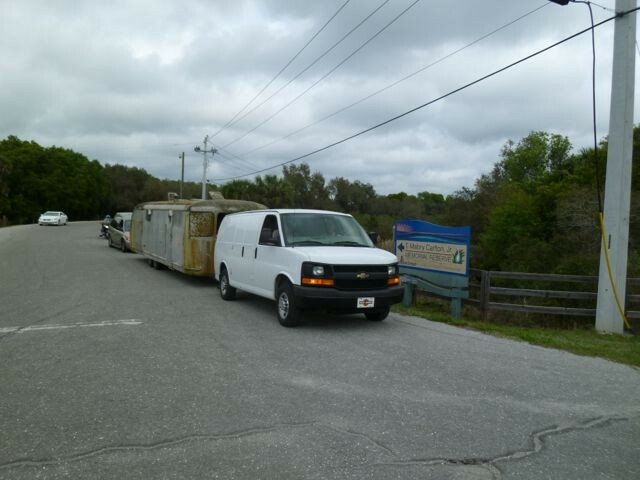 Easement exempts utility use and park use, "similar to those presently permitted at Myakka River State Park." resource-based recreational and educational use by the public." ". . .Managing the Carlton and Pineland Reserves alone would require at least 4-6 full time staff, just for prescribed fire, security, monitoring, planning and contract administration." 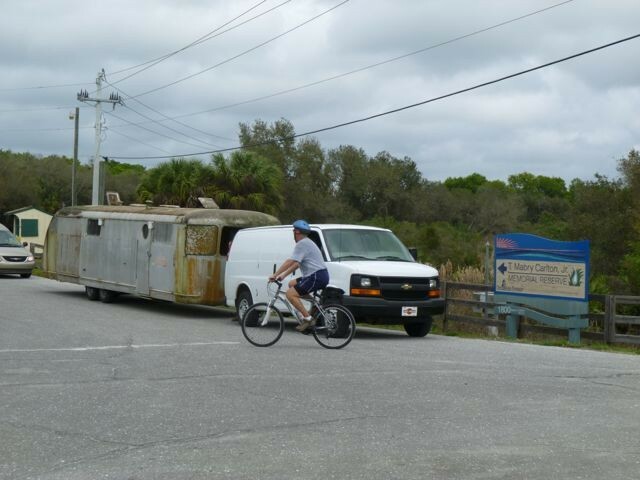 "Apoxsee, Sarasota County’s Comprehensive Plan provides for the protection and management of the county’s native habitats balanced with the need for public resource- based, ecologically benign, and non-consumptive recreation." Repeats protection for "all natural communities. . .especially those designated as threatened, endangered or species of special concern," provides "opportunities for scientific research and for ecologically benign, non-consumptive, resource-based recreational and educational use by the public. " 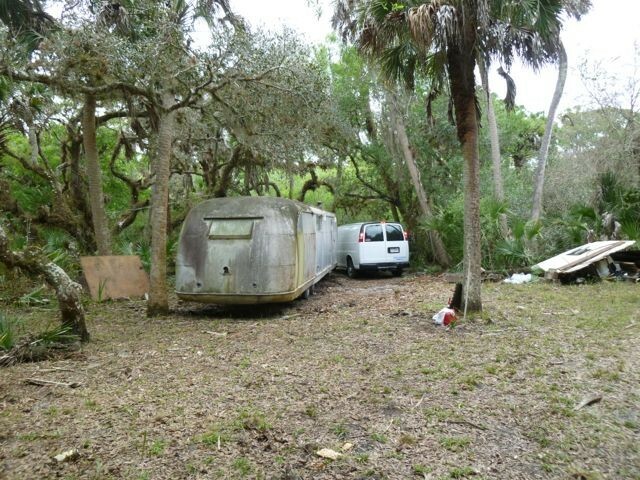 Prohibits private vehicular use of the Carlton: "A loss of public confidence in the water supply, even absent a true health hazard, would be a disaster for Sarasota County Utilities in terms of public perception and relations." 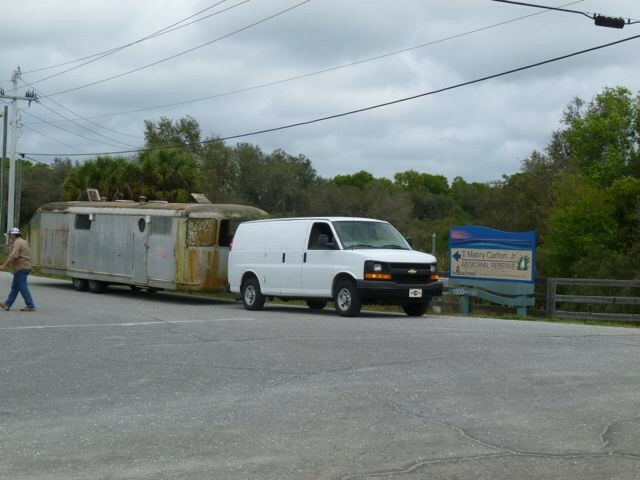 "Motorized vehicular travel will continue to be banned, with the exception of Sarasota County staff or their representatives, within the Reserve." Prohibitions include discharging pollutants, cutting or removing native vegetation, constructing new road crossings, airboats, constructing any structure not related to a water-dependent activity, and any other activity which adversely impacts resource values in the river area.